I am a right tea wifey and firmly believe that a cup of tea can cure whatever ails you. 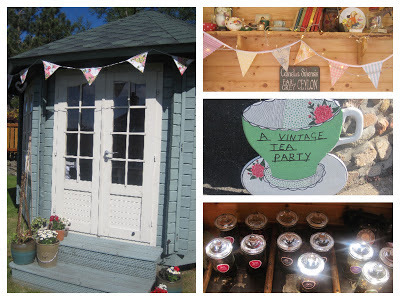 I am also a lover of all things vintage so A Vintage Tea Party is the perfect combination. 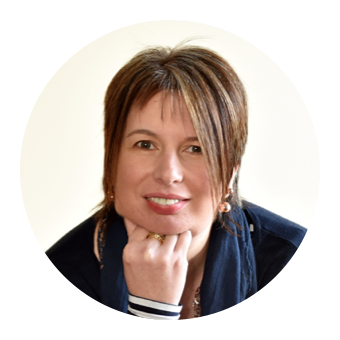 Hazel Williams hires out a vast collection of vintage crockery, cake stands, linen and props for weddings and events. 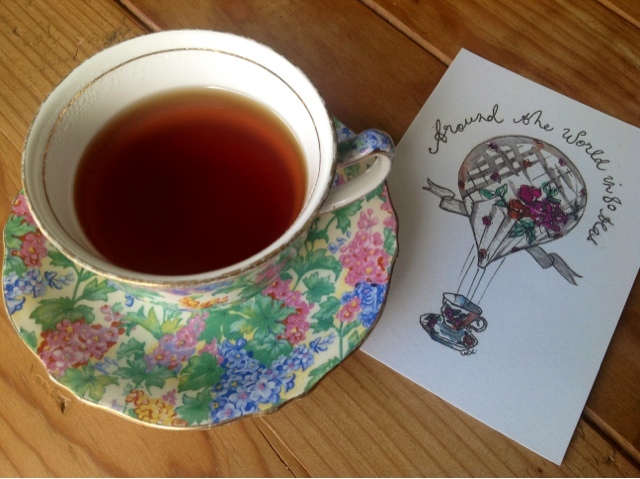 I first met Hazel last year when she generously provided crockery for a Marie Curie Blooming Great Tea Party and I avidly follow all her vintage loveliness on Facebook so was delighted to see she had a new string to her bow. Around The World in 80 Teas. 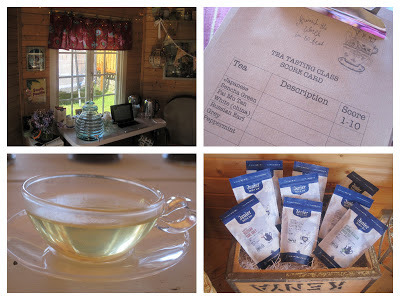 I wasted no time in booking myself and my friend K in for a tea tasting journey. In association with Jenier Teas the session promised a brief history of tea, tastings from around the world, tea & cake and a goody bag. All to take place in a Summerhouse in Aberdeen. The tickets for our tea tasting adventure duly arrived in the post with the instruction that passports were not required. I celebrated with a cup of tea in my maternal Grandmother's gorgeous chintz tea set. On the day of our tasting Aberdeen was basking in glorious sunshine. 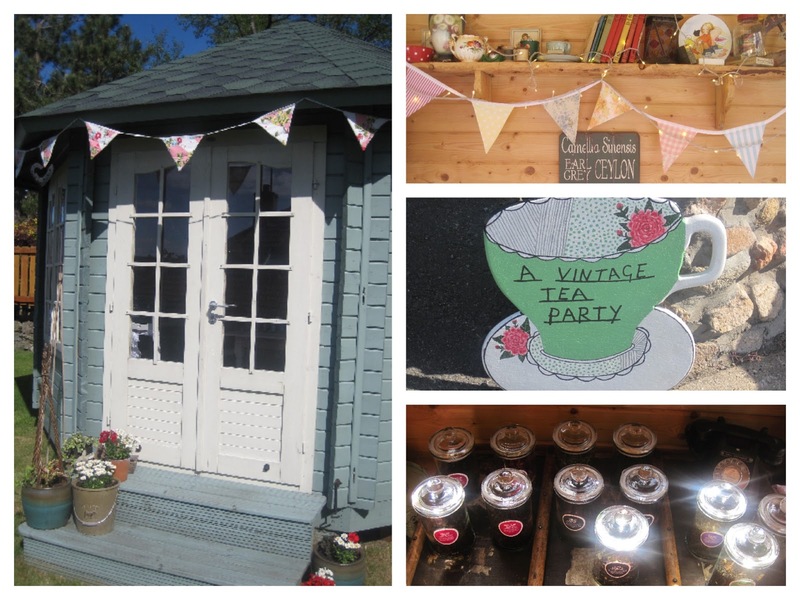 A Vintage Tea Party teacup sign pointed us in the right direction before heading round to the back garden and Hazel's gorgeous summerhouse. I now have total summerhouse envy and am plotting to replace boy and girls outgrown playhouse with one. It's so cosy inside with twinkling fairy lights, comfy sofas, bunting, vintage children's books, tea chests and much retro nostalgic gorgeousness. And so to the serious business of tea history and tasting. I had recently watched a fantastic two part documentary presented by Victoria Wood on the history of Tea and the British fascination with it which was a useful background to have. The first fact of the day was that all tea comes from only one plant. Camellia Sinensis. Green tea from the tips and white from the inner tips picked in the dead of night. Oolong and black teas are made from fermented leaves. Initially tea was used only for medicinal purposes and we were somewhat distraught to discover that by adding milk to your tea any health benefits are negated. The quirky teacup and hot air balloon logo was brought to life hanging above us as we were issued with clipboards to score our teas. First off a bit of drama with a Tiger Leaping Flowering Tea which opens up beautifully into a flower as it infuses. There's a real science to the perfect cuppa. Fresh water must be used. The green and white teas need slightly cooler water so as not to scald the delicate leaves. A collection of kitchen timers pinged when the correct brewing time was reached for each tea. We each had a gorgeous wee glass teacup and saucer for our tastings. Like a dolls tea party. When it came to tasting there was no sipping. Slurping all the way. It would be rude not to. We started off with the delicate and light white and green teas and progressed to the more perfumed. I confessed to not being a lover of flowery teas comparing Earl Grey to a cup that hasn't been rinsed properly and still tastes of Fairy Liquid. My mind wasn't changed and the flowery Earl Grey and Rose Congou were my least favourites. Not my cup of tea. 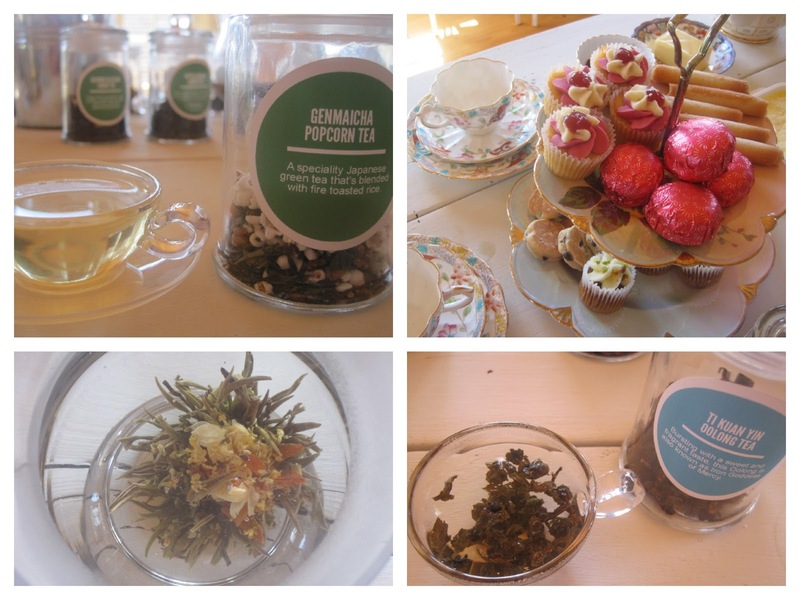 From the more unusual variants my favourites were the Popcorn Tea and the Lapsang Souchong. Both had quite a savoury flavour about them. The popcorn containing toasted rice grains as historically tea was too expensive for Japanese peasants so they eeked it out with rice. I reckon it would be really good iced or perhaps even in a cocktail with some salty popcorn on the side. The Lapsang Souchong is strong and smoky. It smells and tastes of bonfires and BBQ's. Would be great round a campfire. Hazel's husband has likened it to Laphroaig whisky. Following on from the tiny tastings it was time for a proper cuppa. Served in vintage china of course and accompanied by a heaving cakestand, jam and clotted cream. Tallying up we had tasted a total of 12 teas in the course of the morning. Alas all good things must come to an end but we had goody bags to send us on our way. We couldn't wait to get home to open them so had a peek in the car. 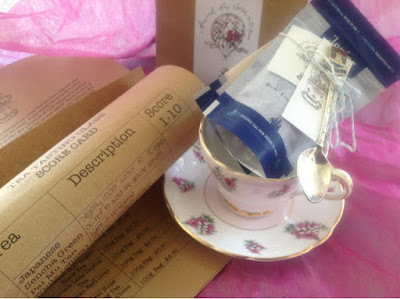 Vintage cup, saucer and teaspoon, biscuits, tea sacs and a further two teas to taste. Nonsuch BOP Nilgiri Black Tea and Duchess Earl Grey Tea. I shall be using the Earl Grey as Pot Pouri. Don't tell Hazel. You can send the Earl Gray here but keep the Lapsang Souchong! Yick Yick Yick to Lapsang Souchong - it's actually given me a migraine before now and that's from someone else drinking it!